If there was any doubt that Elk Grove is no longer the semi-rural sleepy suburban community of 30 years ago that many people wax poetically about is a thing of a bygone era, that notion was recently dispelled. Elk Grove's new big city reality was made evident at a special meeting of the City Council held on Tuesday, May 29. The special meeting was narrowly focused on one agenda item covering issues more commonly associated with larger cities - housing affordability and homelessness. Now that Elk Grove with a population that has surpassed the 170,000 mark is the second largest city in Sacramento County and the six-county region, those urban problems more common to Sacramento and Stockton are now part of daily life for residents and elected officials. The meeting, which lasted about two-and-a-half-hours, included a presentation by Elk Grove's Housing Program Manager, Sarah Bontrager. 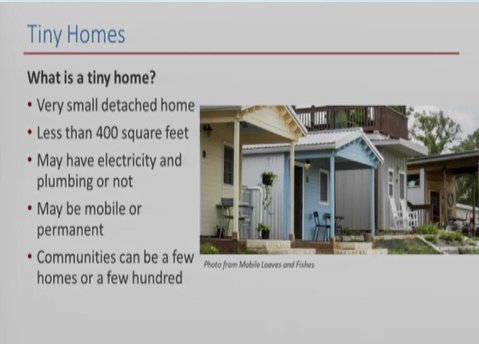 In her hour-long presentation, Bontrager covered several aspects of the homelessness solution, with the vast majority spent discussing so-called tiny homes. The idea of exploring tiny homes as part of solving homelessness was first presented to the city council by Elk Grove resident and smart-growth advocate, Lynn Wheat. At the November 8, 2017 city council meeting Wheat suggested the city explore the development of the small, inexpensive housing units (see second video posted below). During their questioning of Bontrager and deliberations, the five council members expressed a variety of thoughts about tiny homes, as well as navigation centers. The city has purchased two navigation centers which are primarily residential units that act as housing for homeless individuals and families. Council Member Steve Detrick said he would oppose future purchases of residential units for homeless services. Detrick said it is unfair for nearby residences to shoulder the burden in their neighborhoods, and that the long-term solution should be done on a regional approach. "The county has some vacant facilities, that with not a lot of work, could be transitioned into immediate facilities to house people," Detrick said. "We got Boys Ranch and the juvenile hall that shut down. It basically has dormitory facilities, already has full-blown kitchens, and couple that with the services that need to be done." Later during his deliberations, Mayor Steve Ly acknowledged Detrick's thought about working on a regional basis but criticized some of the properties he suggested for Elk Grove's homeless population. "With all due respect Councilman Detrick mentioned the Boys Ranch, and I know where you are going with that; look at our existing resources," Ly said. "But one thing I would not support is tapping the county to go to the Boys Ranch. If you haven't been on the Boys Ranch, it's a prison, and its got barbed wires, it got fences." Ly went on to say that any solution he would support should offer dignity to those being served. When addressing specifics, Ly said he did not want to rule anything out but said he would support the tiny homes but would need further information. Although homelessness was the primary focus of the presentation, public comments, and council's deliberations, the agenda also listed housing affordability as a topic of discussion. Aside from comments made by Hume (at about the 8:20 minute mark of the video posted below) regarding the lack of affordable housing, the issue went largely unaddressed. During public comment, several speakers also focused their remarks on the homeless challenges facing the city and the population. One was Elk Grove resident and retired education Frank Lucia who clarified information presented by Bontrager regarding the city's homeless population. Lucia, who is on the board of directors of the Elk Grove Homeless Assistance Resource Team, noted that the 330 homeless population in Elk Grove figure that he said was cited by Bontrager were just the individuals living on the street. Beyond that, Lucia noted there is a larger homeless population in the city who are less visible and stated the Elk Grove Unified School District in 2010 identified over 400 homeless students and that he was confident that number has increased in the ensuing years. "These are families that are couch surfing," Lucia said. "Councilman Detrick you mentioned that families helping one another, a lot of that does go on, but their conditions change quite dramatically, and we do have kids that are living in cars, we have housed families that been in a car a year at a time and some of them are not identified by our current resources." After a lengthy exchange between interim city manager Jason Behrman and city attorney Jonathan Hobbs and the city council, the city council decided they would not pursue the purchase of residential units for the housing of the homeless population. Instead, they decided to further explore the development of the tiny home model in many different varieties of arrangements including public-private partnerships or part of a future housing development. Behrmann noted with this option the city could have up to $2 million at their disposal to use on the project. Additionally, throughout the deliberations council members noted the expected resistance to wherever the development might happen, stressed that this was just a preliminary step and that there was no particular site in mind. In his comments, Behrmann said combining tiny homes into some future affordable multi-family housing development with a private party could be an easier task for the city council. "We're pretty confident that if you wanted to go down that path, we would be able to have success in making that happen," Behrman said. "I think one of the advantages of that project over all the other ones is the siting issue is not nearly as bad because it is already an existing multi-family unit site, already going to be affordable housing, so people that live there already know they are buying into a unit that is next door to an affordable housing unit, and to add a homeless component, is not a very big change to that." I know a great site with excellent access, great parking, and plenty of room to spread a blanket. Comes with natural air conditioning and a great view of the propane tanks and future casino. Call 1-800-Howard-Hughes!